Hanna Kroeger's research, knowledge and insight led her to create many popular herbal formulas. BLACK RADISH & PARSLEY: A powerful pair of herbs used in conjunction with proper nutrition for the grief of those wintertime surprises. Helps with bacterial infections, bladder and kidneys. Parsley is a blood purifier, cancer prevention, keeps urinary tract healthy, dissolves gallstones and kidney stones, breath freshener, arthritis, liver congestion, spleen, thyroid, and helps with water retention. Ingredients: black radish root and parley leaves. BLOOD TONER: A healthy foundation is essential to our most important life giving system. Including this unique blend of herbs with a good diet is a treasure. Blood Toner is helpful with being a blood cleanser, tonic and builder, lymphatic cleanse, varicose veins, builds the immune system, removes congestion, gout and helps with stamina. Ingredients: yellow dock, cramp bark, yarrow, milkwood, plantain, organic tobacco and tansy. CHEM X: Take Chem X and help your body respond positively to the effects of modern day exposure in an industrialized world. Preserves cleanliness from unnatural exposures. Helps to remove chemical poisons from the body. Chem X will help clean the blood and lymph system, skin infections, build immune system, aids, anti-cancer, liver congestion, remove swelling, hemorrhoids, arthritis, spleen, remove toxins and free radicals, inflammation, allergies, warts and build stamina. Ingredients: black tea, condurango bark, red clover, yellow dock, paprika, chaparral and spikenard. CLOVES: This popular herb is used with parasite cleansing programs. Long touted for its effect on digestion and nausea. Cloves will disinfect and treat an infected root canal. Cloves help with diarrhea, bad breath, Candida, gastro-enteritis, toothache, natural antibiotic, dysentery, colds, colitis, muscle aches, fungus/athlete's feet, intestinal parasites and warts. Ingredients: cloves. D BETS: This quintet of herbs help keep your body's natural resources working to maintain healthy blood sugar levels. Helpful with liver problems, blood regulator, inflammation, hypoglycemia, mood swings and fatigue. Ingredients: bean leaves, blueberry leaves, hyssop, pleurisy root and paprika. ENVIRONMENTAL CLEANSE: A comfortable companion to cleansing diets. A supplement designed to respond positively to modern day living. Helpful in removing pesticides, toxins, chemical poisons, reducing swelling, skin disorders, arthritis, inflammation, removes radiation and free radicals, antifungal, antibacterial and fatigue. Ingredients: bladderwrack, borage, flax seed, watermelon seed, cleavers and taurine. FOON GOOS #2: Along with Kantita, this blend is an accessory to suitable foods designed to help your body maintain its natural resistance. Helps balance intestinal flora. Helpful with congestion, inflammation, respiratory, urogenital tract, immuno-stimulator, antibiotic, antifungal, allergies, hepatitis, anti-cancer, pancreas and sinus congestion. Ingredients: tansy, clay, milkweed, cramp bark, goldenseal leaves and blessed thistle. HERP-X: An effective herbal blend that supplements common sense and precautionary care in order to maintain your healthy fighting environment. Herp-X is helpful with lymphatic drainage, strengthens the immune system, blood cleanser, aids, anti-cancer, anti-bacterial, anti-viral, herpes, expels poisons and toxins, headaches, fights colds, gingivitis, ear infections, peritonitis, bronchitis, diphtheria, strep throat, mouth sores, skin disorders, tumors, leukemia, intestinal parasites, Candida, arthritis, kidney infection and warts. Ingredients: olive leaves, echinacea root and chaparral leaves. KANTITA: Your body has the ability to maintain healthy levels of good and bad bacteria, common fungi and ordinary yeast. A popular product formulated at the dawn of modern dietary supplements, Kantita works in alliance with Foon Goos #2 and proper diet. Helps balance intestinal flora. Kantita helps with arthritis, anti-cancer, blood purifier, hemorrhoids, itching, liver congestion, lymphatic cleanse, psoriasis, swelling, asthma and kidney congestion. Ingredients: condurango bark, yellow dock and red clover. MEN'S SPECIAL: there's no time like the present to persevere on the course of healthy prostate maintenance. This blend is formulated for the man who likes to stay on top of his health. Helpful with genito-urinary system, inflammation, prostate problems, male impotence, reproductive problems, thyroid, asthma, hormone regulation and kidney problems. Ingredients: black walnut leaves, saw palmetto berries and cornsilk. METALINE: People concerned about maintaining healthy levels of resistance to metals use this formula to keep their bodies in a healthy state. Metaline is helpful with removing heavy metals, toxins, blood cleanser, circulation, inflammation, congestion and nausea. Ingredients: pumpkin seed, okra, rhubarb root, capsicum, peppermint and dulse. OLIVE LEAF: Olive leaves have been used traditionally for maintaining good health. Studies suggest olive leaves may be useful for viral conditions. Helpful with arthritis, blood cleanser, intestinal parasites, skin disorders, bronchitis, diarrhea, flu, pneumonia, sore throat, anti-fungal, ulcers, Candida, allergies, anti-bacterial, and warts. Ingredients: olive leaves and yarrow. PAP: This powerful mixture has become a favorite of our female customers for use in conjunction with routine examinations. PAP helpful with asthma, ant-viral, papiloma, infection, positive pap smear, lymphatic congestion, pelvic disorders, insomnia, swollen glands, and warts. Ingredients: blue flag, blue malva, blue vervain, papaya leaves and mullein. 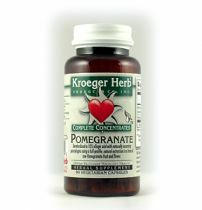 POMERGRANATE: one of the richest sources of antioxidants more than green tea or red wine. Supports heart and arterial health; research shows a decrease in the signs of atherosclerosis and cholesterol. Helpful with menopause and osteoporosis. RASCAL: A top seller for over 20 years! Rascal safely and naturally maintains your body's balance when unfriendly food brings on unfriendly visitors. Adequate food preparation and hygiene benefit this quintet of herbs. Supports the body's natural resistance to parasites. Rascal helpful with fungal infections, skin parasites (scabies, crabs, and lice), removes mucus, asthma, diarrhea, anti-bacterial, respiratory, removes heavy metals, allergies, anti-viral, staph and strep infections, arthritis, intestinal parasites and worms, motion sickness, roundworms, tapeworms, and warts. Ingredients: pumpkin seed, garlic, cramp bark, capsicum and thyme. ROSEMARY PLUS: Living in an excessive electrical environment means taking steps to keep electromagnetic balance at its neural state. This trio of herbs is good in combination with antioxidant. It helps to maintain a healthy liver, balances blood sugar problems and hormones. Rosemary Plus helps with liver congestion, memory enhancement, digestive problems, heart tonic, bad breath, balances hormones, joint inflammation, fatigue, depression, PMS, nervousness, protection against EMF (electric magnetic fields), emphysema and blood cleanser. Ingredients: damania, rosemary and cinnamon. WORMWOOD COMBINATION: One of our best selling products and praised around the world! This secret formula is unequaled in today's crowded wormwood market and supports the body's natural resistance to parasites. Wormwood Combination helpful with eczema, diarrhea, herpes, liver congestion, anti-cancer, skin disorders, vaginal discharge, Candida, valley fever, intestinal parasites, tapeworms, hookworms, pinworms, ringworms, anti-bacterial, anti-fungal, arthritis, and inflammation. Ingredients: black walnut leaves, wormwood, quassia, cloves and male fern.